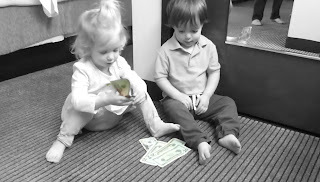 You know teaching your kids about money is important. You know starting early makes sense. But sometimes it’s just helpful to hear it from another parent. Someone else in the trenches. Someone else with young kids and a crazy schedule. It’s that little extra push you need. Ask around. See what the other parents in your community are doing and why. Ask someone like Catherine Alford with her two young twins. Why is she allocating her precious parenting time to personal finance lessons already? Three simple reasons. She wants her kids to be prepared, independent, and — above all else — happy. Get it straight from Cat in this short video. Cat thinks of it as creating a personal finance legacy that her kids will in turn pass along to the next generation. Inspired to start your legacy?